All 46 players with Kevin Durant outside his KD-branded plane. When Kevin Durant traveled to basketball tournaments in high school, everyone piled in a van. There was no smoothie bar, sneaker-lacing station or All-Star guest appearances. And definitely no airplanes. Today was a different story. With music pumping through speakers and Durant’s photo stretching from nose to tail, 46 aspiring athletes boarded Alaska Airlines “Flight 35.” The KD-branded Boeing 737-900ER made its first appearance during the Western Conference Finals and will be in fleet for two years. Today, the plane made a special trip, bringing four top teams from Los Angeles and Oakland to the Bigfoot Hoops Las Vegas Classic. From the minute he got on the airplane’s PA system, it was clear Durant was here for one reason: surprise these players and have some fun. With a DJ at the gate in Oakland, the players started a dance-off. The high schoolers had no idea a legend would be joining them. As soon as Durant boarded the aircraft, the plane erupted with cheering. Every summer, the Golden State Warriors forward attends youth basketball tournaments and spends time with players. He’s never flown with them to mark the occasion. Kevin Durant didn’t know any of the high schoolers before today, but he says there’s an instant bond between basketball players. Sophomore Solomon Jones is one of the youngest players on the I Can All-Stars team, surrounded by seniors getting ready for college. Inspired by his “Rise. Grind. Shine. 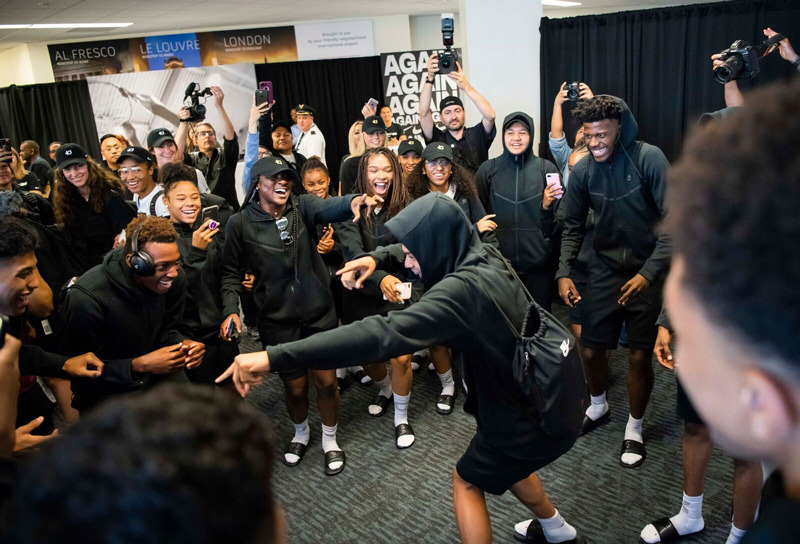 Again” motto, KD’s team, Nike and Alaska Airlines partnered to create a unique experience for the players during their layover at the Oakland International Airport. Not only did they get to meet one of their idols – each player received Durant’s latest signature Nike shoe, the KD11. Players customized their new KD11s, courtesy of Nike. 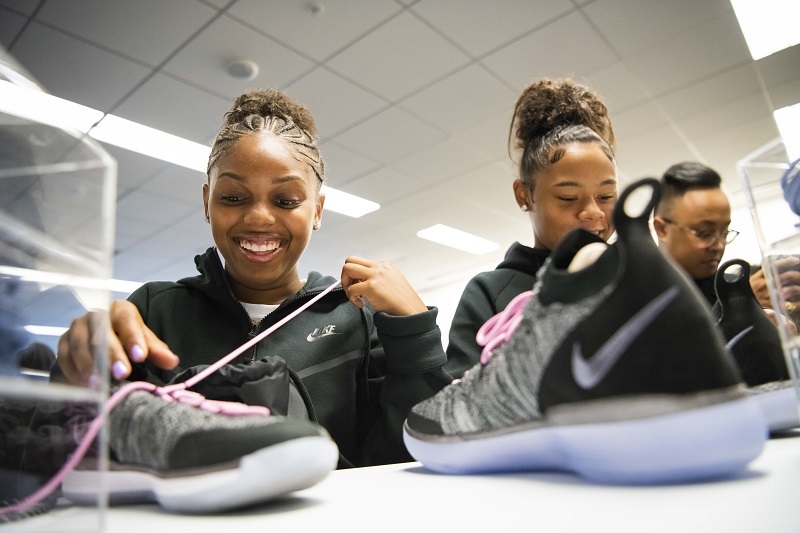 While taking selfies with Durant and dancing with teammates, the high schoolers sampled a protein-packed breakfast bar and personalized their new kicks at a custom lacing station. On the last leg to Las Vegas, Durant took the beverage cart down the aisle, personally delivering a signed copy of Slam Magazine to each player with their picture on the cover. 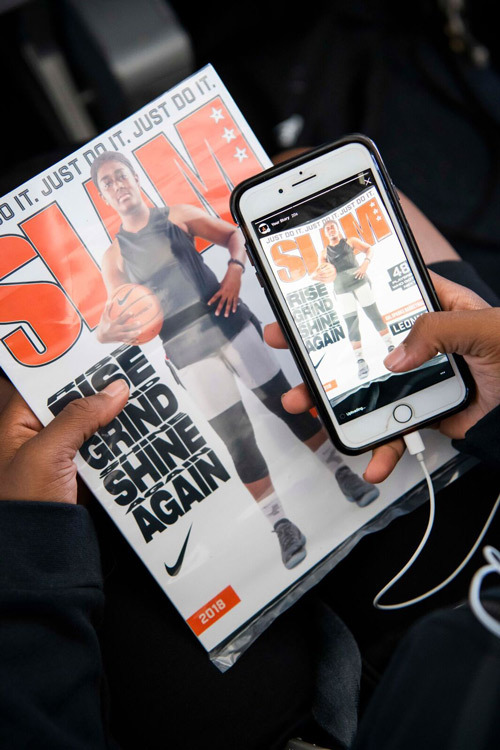 Every player received a signed copy of Slam Magazine featuring their picture on the cover. Today’s journey ended in high spirits, but it’s just the start for the 46 players aboard Flight 35. Throughout the tournament, Durant hopes they remember why they’re here. “It’s really easy to get caught up and forget that the reason you’re doing it is because you love the game of basketball,” he said. Kevin Durant and the Alaska Airlines Flight 35 crew. A youth basketball player waiting to board Flight 35. The Alaska Airlines Flight 35 crew. Alaska Airlines, Nike and KD’s team partnered to create a one-of-a-kind experience. One step closer to seeing Kevin Durant and playing in the Bigfoot Las Vegas Classic. 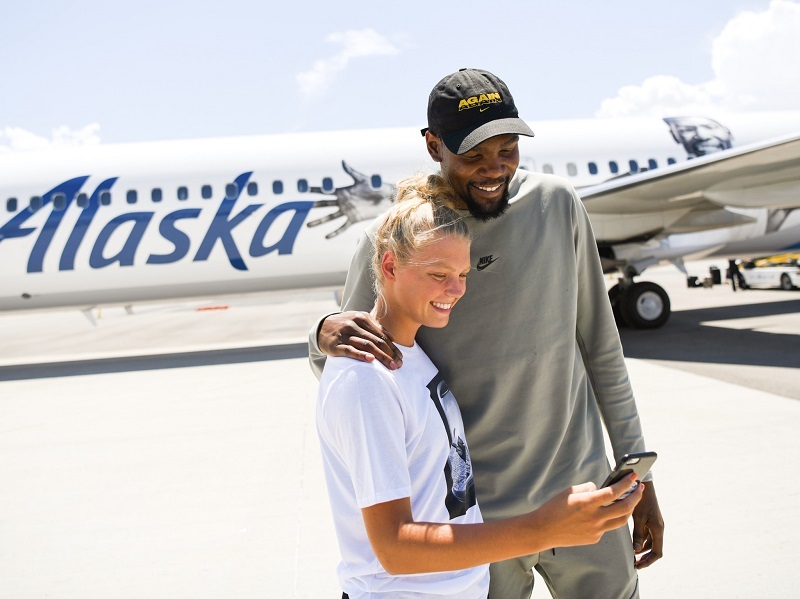 Kevin Durant with Alaska Airlines Pilot Jodi Stahly. Kevin Durant exiting the aircraft in Oakland, where he greeted two more youth basketball teams. Taking selfies with their idol, KD. The smoothie bar in Oakland. Kevin Durant arrives in Las Vegas. Check-in started in Los Angeles early Wednesday morning. Solomon Jones of the I Can All-Stars team is ready for Flight 35. Kevin Durant greets players in Oakland. Every player received headphones and a neck pillow. Alaska Airlines employees showing off their new kicks.